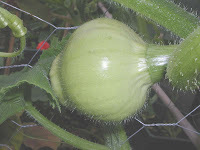 On watering and rain, pumpkin or squash, male or female asparagus. I hate watering, and last summer I had to do quite a bit of it, hence my raindance, which incidentally seems to have worked far too well! It is incredible the amount of rain that has poured in the last few weeks, and it doesn't look as if it is over yet either... However, over the weekend I have sneaked briefly to the allotment in the breaks between showers. The French beans are doing well, despite the wobbly staking; I picked my first 150gr and had them simply boiled with olive oil - they tasted amazing, so fresh! Pumpkins have decided they will take over the plot and are doing their best: I spent most of my time today pulling strings for them to run on. I was not aware that the flowers smelled so strong and sweet, and it is lovely to see the fruit forming. I have called them pumpkins but they might well be squashes: I do not know exactly what they are as I saved some seeds from my organic vegbox last year (when I was still a newbie gardener ;)) and did not think of writing down the name. I am happy they are doing well also because I shared some of the seedlings with Claire, who only got her allotment in July and was starting from scratch. Although I warned her I was not sure what would come of the plants, it would have been horrible if they turned out to be worthless!